After laying out your new tiles or pavers, you’re probably looking forward to seeing that beautiful finished result of a new wall or floor. Unfortunately, many people are surprised and more than a little disappointed in the finished result of their work, because on first viewing, the tiles or wall will be coated with a white coloured haze. This haze is the residue left over from the grout used in tile or floor installation. A lot of people are tempted to reemploy builders or hire cleaners to scrub this grout haze away, but in practice it’s actually a very simple DIY project. With AquaMix Tile & Grout Cleaner, you’ll be able to get your floor looking sparkling new after roughly a day after the installation is completed. This article will explain in better how to achieve that sparkly finish and get rid of that annoying grout haze. Timing is key here, you want to get rid of the grout haze before it has hardened too much. You’ll want to get rid of it as soon as possible after the installation is complete and the grout has cured. Removing the grout haze too early could bring up the grout that you want to remain between the tiles, and this could in turn create a new layer of haze. Too late and you’re looking at some backbreaking work as the haze has hardened. So ideally, wait about a day after installation before commencing the grout haze removal process. Some home remedies out there recommend you use a mixture of vinegar and water, however to get the desired effect make sure you use Bellstone’s Tile & Grout Cleaner, which is still safe for use. Simply follow the instructions on the bottle and you’ll be able to scrub away a great deal of the grout haze in the first spray. There are other things you can also try for more specific issues. For example, if the grout haze is not too thick or extensive, you could try cleaning individual tiles. To do this, by a Scotch Brite pad from your local hardware store, and use some warm water to scrub individual tiles. This is a time consuming and tiring process if you’re looking to clean an entire wall or floor this way, but it is an effective and useful trick to keep in mind if there are specific, isolated spaces with grout haze. 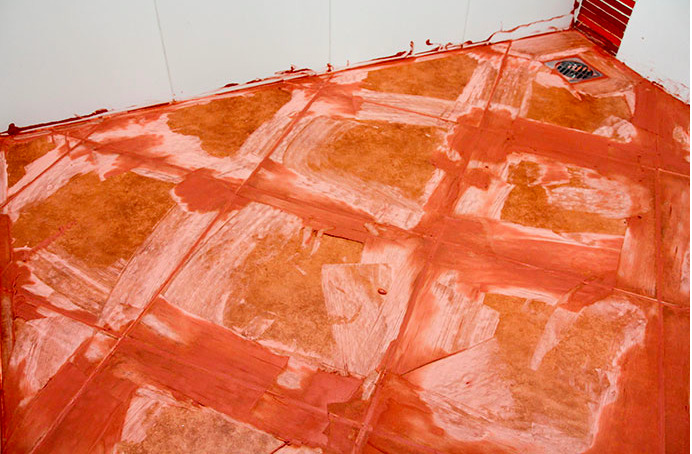 If you do attempt this method, do not use steel wool instead of the Scotch Brite pads as this can damage the tiles, especially if they are more of a sensitive material such as terracotta. Scotch Brite pads will be gentler on the base material but just as effective in removing the grout. As with any chemicals, when you’re using Bellstone’s Tile & Grout Cleaner there are some basic safety measures you should follow. Glove are a must, so as to protect skin from coming into contact with the solution. Additionally, while the solution is effective in removing grout haze, it could potentially discolour metals and cements, so it’s important to avoid it coming into contact with these materials. Finally, ensure that you properly ventilate the space that you are treating, as the product will create some fumes. Regardless of how you remove the grout haze, after you have finished scrubbing the tiles, give them a dry and buff until dry using a terrycloth towel. This will prevent any residue from drying and forming a new coating of haze. Even after buffing and drying, it’s also important to note that some additional residue might settle. This might make it necessary to apply the solution a couple of times if the haze is proving to be stubborn. It’s also worth monitoring the space after you’ve done a removal round. If there is a light dusting starting to appear, then you will be able to vacuum it up quickly before it has a chance to harden and require a more robust removal again. Removing grout haze does not require the expense of hiring builders or cleaners, and the fact that it might take a couple of rounds of cleaning means that tackling the job yourself could save you a good deal of money. If you are still unsure of the process, it might be worth putting a call in to a professional tile setter (or quizzing the one you hired to set the tiles), to make further enquiries.